When your dog senses danger, he barks to alerts you to the incoming danger. It sometimes leads to saving your life. It is reassuring, and that is what make us glad that we have our dog as a companion. But when your dog starts to bark for no apparent reason, that is another story. Well, if your dog keeps barking for no reason at all, you sure are going mad and getting annoyed. You will resort to yell to your dog, or worse you will resort to violence. That is not cool at all. #1 - Understand why your dog barkswe should know that for dogs, barking is a way for them to communicate to us. It is a natural means for them. There are a lot of reason why dogs bark. They may try to gain attention, excited of something, warn another animal, alarming us of intruders, feeling insecure, feeling anxious or fear of something, or maybe they are just want to bark for no reason at all, yes. There also some case where the dog’s owners reinforce the barking behavior unknowingly by praising or giving affection when their dogs bark. After you understand why your dog barks, you can actively find some solutions to stop your dog from barking. 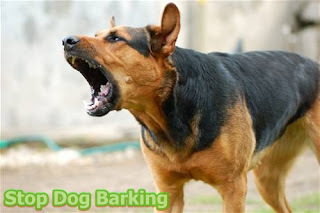 The goal is not to completely stop your dog from barking, especially when the purpose of the bark is to alarm us of danger or to alert us of intruders. The goal is to stop your dog from barking without clear reason or barking just from a slightest noise and to stop your dog from barking if you ask them to. Like what we have pointed above, sometimes we reinforce the barking behavior unknowingly. When you see, your dog get excited and barking continuously, you want to stop him from barking by picking him up or petting him so he can stop barking. The action indeed can stop your dog from barking, but your dog interprets your action in a different way. Your dog thinks that you like him to bark, the prove is that you pick him up and pet him make your dog wants to bark again at another time. This is a wrong approach to stop dog barking, so stop this action immediately. Do not give your dog the opportunity to continue the bad baking behavior. Start to give your dog some exercise by making him learn some commands and give some jobs to do. Also, bring your dog outside for a walk to give him some exercises. But, remember, do not reward unwanted behavior of your dog, like the pervious point about dog’s excitement with affection and praise. This seems like a cruel approach, but it is necessary to lessen unnecessary dog barking behavior. Stop giving attention to your dog while he is barking. Do not touch your dog, do not talk to him, do not look at him. This convey your intention of disapproval of your dog’s excessive barking behavior. Ignore your dog's barking until he stops. When your dog become quiets, you can finally give him attention and give him treat. 0 Response to "6 Tips How To Stop Dog Barking"